Apple is letting Verizon Wireless sell the iPad: The trick? Verizon will only offer through its 2,000-plus stores the Wi-Fi iPad, not the 3G model. The 3G iPad works only over GSM networks (up to HSPA 7.2). Instead, Verizon will sell you a plain Wi-Fi iPad ($500, $600, and $700 for 16, 32, and 64 GB); or, for an extra $130, it'll throw in a MiFi router. That $130 is the same price difference Apple and its partners collect for a 3G iPad over its Wi-Fi–only brethren. Verizon pairs the iPad and MiFi with plans nothing like what the carrier has offered before. These are fixed-price, moderate-use offers with no termination penalty; the terms are just like AT&T's offer for the 3G iPad, but Verizon's prices are better. Verizon will charge $20 for 1 GB ($20 per GB over that) and $35 and $50 for 3 GB and 5 GB (with $10 per GB overage fees). AT&T charges $15 for 250 MB and $25 for 2 GB for its 3G iPad plans. Additional units of each can be purchased at the same price after the 30-day period expires or you use up all the data. Virgin Mobile offers unlimited Sprint Nextel 3G broadband with a USB modem or MiFi for $40 for a 30-day period. Because the MiFi can handle up to five devices over Wi-Fi, one could argue that if you don't need an iPad and do need a MiFi, this is a slick deal. Buy the package and sell the iPad without even opening its box. You'll probably get a few dollars under list for it. Barnes & Noble pushes pressure on ereader market with $149 Wi-Fi Nook: The Nook is a ebook reader that's gotten mixed reviews. Although B&N keeps upgrading the firmware, the device hasn't reached the maturity of a Kindle or Sony Reader. However, B&N made a number of interesting choices about the device and its software features that may bear fruit. In the latest twist, B&N has released a $149 Wi-Fi–only Nook, $50 less than the repriced 3G flavor (formerly $259). The Kindle omits Wi-Fi, which would make the Nook's service an advantage, except that B&N will only be enabling AT&T hotspot automatic logins in the 1.4 firmware release, several months after the device's introduction. That's obviously a more critical feature in a device that only connects via USB or Wi-Fi. Like Amazon, B&N is building an ecosystem of ereading that allows the same content to be read on proprietary hardware devices, and mobile and desktop operating systems using reader software. B&N's Reader app for the iPad is quite marvelous, better for reading (and formatting to your liking) than Amazon's Kindle app or Apple's iBooks program. Later in the day, Amazon dropped its Kindle reader price to $189 (down from $259). 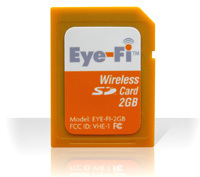 Two of my favorite companies are working together: Eye-Fi is updating its line of SD card-based Wi-Fi adapters to use Devicescape's automated hotspot login system. This is extremely neat, because otherwise, those hotspots are unavailable for login. Eye-Fi offers a network of 21,000 locations via AT&T (formerly Wayport, which AT&T acquired) already, where the card automatically detects and logs in. The Devicescape deal opens up the card to hundreds of thousands of additional locations. Devicescape doesn't sell access, but rather lets you store all your network credentials via an account you maintain on its Web site. Any device or computer you use with Devicescape software obtains the right credentials for login when you're at a location in the network. Devicescape also characterizes and provides automated login for open and free locations that would otherwise have a button to check or page to navigate through. Eye-Fi includes one year of hotspot access in its Explore X2 and Pro X2 models, and those cards will gain access to Devicescape's service in May. On 1 June, you can purchase a year of hotspot service for other cards for $30/yr. Eye-Fi has a special offer until 31 May for Connect X2 and Geo X2 users for $15/yr. The Geo X2 was announced today, too; it's an Apple Store exclusive. For $70, the 4 GB card includes geolocation, and works seamlessly with Apple's iPhoto software and MobileMe service to transfer pictures and movies. The card also includes the Endless Memory features that deletes images and videos as space is needed that have been confirmed as transferred off the card. Yes, I know already as a father one shouldn't play favorites. But in the Wi-Fi space, there are some clever firms I've been talking to practically since they started developing products and services in the space. Eye-Fi and Devicescape are two of that select group. Eye-Fi took an ordinary item, the SD card, and embedded a processor and Wi-Fi radio alongside memory. The company continually improves cards' firmware and desktop software, as well as providing additional useful add-ons. It remains extraordinary to me that camera manufacturers have generally not been able to offer a fraction of what Eye-Fi can with its substantially fewer resources. An increasing number of cameras support specific Eye-Fi features and needs (such as not powering down the camera while transfers are in progress). Eye-Fi is the platinum standard for the industry, while most camera makers are struggling for bronze. Devicescape has spent years trying to remove the need for users of mobile devices to have to enter tedious data, and enabled equipment with just a few buttons and no touch screen or keyboard to gain access to hotspots that would otherwise be unavailable. Its approach and software should have had an open embrace from Apple in the iPhone OS, and by other phone and gadget makers. Devicescape is still pushing this "many logins, many hotspots, no fuss" approach with new improvements all the time. Barnes & Noble's Nook 1.3 software update makes the built-in Wi-Fi more usable: The company has finally enabled its promised "Read in Store" option, which connects a Nook automatically to Wi-Fi networks in Barnes & Noble locations, and allows owners to read an ebook in the store at no cost for up to an hour per day. (You can't choose among all ebooks, but some smaller set that's been made available from "more than 200 publishers" including all the major ones.) The feature is still in beta. The company has also added a test version of a browser, which I imagine is primarily to let owners connect to Wi-Fi hotspots other than those run by Barnes & Noble. Even free locations often require a click to accept terms, or even an account for registration purposes. Boingo users and those with other accounts will be able to log in from a Nook this way as well. The Nook includes 3G wireless, but when traveling outside coverage areas, inside in a place with weak reception, and outside the US mobile contract area, Wi-Fi will be a big help for getting material. It's unclear whether browser over 3G is included; Amazon allows browsing with an "experimental" tool in its Kindle hardware at no additional charge over 3G. I wouldn't have expected this: Piles of reports have appeared from users who can't get reliable connections from an Apple iPad to their Wi-Fi networks. The main problem appears to be that in a place where other devices see a strong Wi-Fi network signal, the iPad apparently only receives a weak one. This isn't just an artifact of the interface: those who run speed tests find the speed highly variable, especially compared to other devices (including iPhones) on the same network in the vicinity. Some users are also getting network disconnections and reconnections. Apple has posted a support note about an issue with an iPad not rejoining a network that it's already connected to which seems to involve only non-Apple simultaneous dual-band routers in which the same network name is used for both 2.4 and 5 GHz bands with different security methods (WPA on one and WPA2 on the other, for instance). I expect given the volume of complaints that we'll see a 3.2.1 release of the iPad firmware post haste. So you might have heard about this thing Apple released on Saturday: I've had one for a day, and while it's marvelous--certainly the best computing device ever produced of its size or nature--there's nothing under the hood to do with networking that's worth reporting on. The iPad handles 802.11a/b/g/n with 2.4 and 5 GHz support for the appropriate standards. The flavor that adds 3G and a GPS receiver is due "in late April," according to Apple. With the no-contract deal Apple snagged for 3G use with AT&T, I'm curious to see what non-US carriers agree to as 3G iPads are launched in other countries. Gizmodo spurs sudden buzz about 802.11n in the next iPhone: Gizmodo spots a job listing from Apple for an iPhone engineer who needs 802.11a/b/g/n implementation knowledge, and leaps to the notion that the next model of the iPhone may include 802.11n. I haven't written about this, despite what seem like thousands of posts at various blogs, because my reaction was twofold. Second: You don't hire a handheld engineer today with 802.11 experience that doesn't include 802.11n. It's contemporary technology. I didn't get this buzz when I wrote in March 2009 about why and when the iPhone might get 802.11n. I thought Apple might put single-stream N into the iPhone 3GS, which it did not. It will clearly arrive in the next iPhone model as the chips are ready to go. Single-stream N doesn't magically make the iPhone's data transfers much faster. It will definitely speed them a bit. Rather, it improves range and eliminates coverage holes, while allowing better network neighbor behavior with other 802.11n devices. Gizmodo noted in September that the latest iPod touch revision included Broadcom's 802.11n chip that also had an FM receiver built in. Handheld makers can turn to Devicescape for seamless login, access maps, hotspot aggregation: Devicescape is updating its Easy Wi-Fi system to offer equipment makers an all-in-one deal to consumers. Buy a camera, for instance, and the device comes with lifetime worldwide hotspot access along with no-button seamless login. Capable devices will also gain maps showing available in- and out-of-network hotspots in proximity with an annotation for quality. This move could change the market for attaching Wi-Fi access to mobile devices if manufacturers hop on board. Selling devices that have permanent, seamless access to hotspot networks would seem to command a premium, and reduce friction in using a device. Less friction means fewer product returns; premiums and fewer returns mean higher margins. The consumer has the cost of Wi-Fi hidden in the device price, but considers the value of the device as an overall flat rate. It's a "tax," but one that's exposed in the purchase price. This is a classic multiple-party win. Manufacturers sell more gear at higher prices. Hotspot venues gain more users who, not paying for service, pay for goods; and additional usage produces incremental revenue for hotspot operators. And the consumer wins by having devices that are simpler to use and keep them more connected, something that the success of cell phones and the iPod touch seem to confirm is desirable. This latest transition turns Easy Wi-Fi into a very specific form of hotspot aggregator: only for equipment makers. Unlike Boingo Wireless or iPass, Devicescape won't have a customer-facing access plan. Rather, manufacturers will pay the firm per-device fees that cover unlimited eternal hotspot use by equipment purchasers. The firm's CEO, Dave Fraser, said, "It's obvious that there's a big attraction for putting Wi-Fi into devices, whether it's netbooks, new types of consumer electronics, like media players or ebook readers," and so on. But device makers have a challenge. Fraser said companies could "ship the device with service included, which is theoretically a great experience for the consumer, because it just works," but that's "very expensive for them." Nintendo, Kodak, and a few camera makers all included free access for a limited time to hotspot networks (Nintendo partnered with Wayport in the U.S.; Kodak and others with T-Mobile). Those deals all expired, and new devices haven't been shipped with bundles; the exception is Eye-Fi, which offers yearly rates for Wayport hotspot access, bundling the first year in with some memory cards. Amazon's Kindle includes free Sprint 3G access, but the bookseller clearly pays a fee to Sprint for each book or media item downloaded. Fraser noted also, that even with bundles, consumers are typically limited to the country in which a device was purchased, which doesn't conform to modern travel plans. The second option is to "leave it up to the end user" to configure and figure out. Again, Eye-Fi is the only firm that makes mobile equipment that's easy to configure for multiple networks from a desktop computer with a keyboard. Apple gets around this with the iPhone OS 3 software by managing some hotspot connections that require a button to be clicked or a certain kind of login. I've tested a ton of Wi-Fi-enabled mobile devices, and the single most irritating part of using them is navigating admission to a hotspot, even one that you're already paying a monthly fee to use. Until now, Easy Wi-Fi's proposition was to insert itself at the "leave it up to the end user" phase, offering software for Windows and Mac OS X, as well as smartphones and a few other devices that allow third-party software to be installed. Boingo Wireless tried to fill this hole in part by offering its software for integration with third parties and manufacturers. Skype is probably the highest-profile partner, with a per-minute hotspot rate (that's astoundingly high at $0.19/min.) available at present only to Mac OS X Skype users. This is where Devicescape is attempting to step in. 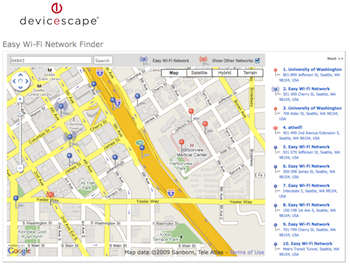 Added to the connection part, Devicescape will provide features to find hotspots, and a global access plan. Fraser said, "We're offering this package at an economics that a device manufacturer should easily be able to ship lifetime access products." He noted that Devicescape currently manages 400,000 session connections per day across all users and platforms, and this has allowed them to capture a massive amount of data about hotspots available around the world--2m access points of all kinds, which the company categorizes. Fraser said the company scores a hotspot based on connection quality, signal strength (which obviously varies enormously), bandwidth, and the number of people who connect over time. Weighted into that are values from the most recent connections, too. The hotspot's score is represented on a map as a blue pin with no signal waves up to three signal waves (3 on each side). The no-wave pins are from locations about which not enough information has yet been collected. "We have an innocent-until-proven-guilty model: if we see an open access point, or a free network, we assume that it's meant to be shared until we're told otherwise," Fraser said. The company will remove any location on request. In years past, I'd have disagreed with this policy, but it's clear from my travels in the last year that a vanishingly small number of access points available from a public street or in trafficked areas that have no protection are intended to be private. Fraser also notes--and I agree--that there's no definitive database of networks that are intended to be free and open; JiWire has a large database, but (despite a multi-year effort) it's not exhaustive since it's network-operator reported, and it doesn't show excluded access points. Fraser said that of 2m scanned access points so far worldwide, only 100,000 meet Devicescape's criteria for reliable quality that they would offer to its customers. As with Skyhook Wireless's method of capturing data from end users who employ its Wi-Fi positioning system to supplement wardriving, Devicescape will rely nearly solely on automatically provided data from users. "Every user ends up reinforcing and allowing us to grow the network," Fraser said. 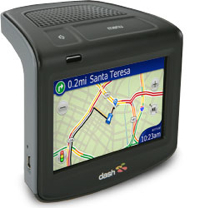 The mapping software will be available on smartphones and other devices with the ability to display and navigate a map; the company's Web site will offer the map directly starting 20-Oct-2009. Fraser wouldn't disclose which for-fee networks are partners, only noting that the firm had worked out terms that allow it to offer eternal access per device. Because the software will keep the previous features, those with access to AT&T or T-Mobile or any other commercial network will be able to overlay that access into their account as well. "We don't want to ever charge for premium access, but we do see ourselves as being an onramp," Fraser said. Microsoft signs three-year deal with Wayport for old and new Zune owners alike: This is a nice win for Zune users, Wayport, and McDonald's, each in their own way, and it's something Microsoft can simply write off as useful marketing--and a way to get people to try the latest models of their music player, which are being released on 16-September. The Zune doesn't include a Web browser or any Internet focused features; it's not an iPod touch. But you can use Wi-Fi to browse the Zune Marketplace for music and games, and download new songs in programmed channels, music selections created by a variety of artists and stations. Zune offers both music purchases and a subscription for unlimited music listening. The new models range from $149 for an 8 GB flash model to $249 for a 120 GB hard drive-based player. The feature I'm most interested in is Buy from FM, which leverages the built-in FM tuner and very low-bandwidth data that's already pushed over analog AM/FM. (See my write-up of this feature from last week.) With Buy from FM, when you're listening to radio stations that participate, you'll be able to click a button and buy the song you're listening to if you're connected to a Wi-Fi network. Zune Pass subscribers can download the song at no additional charge. If there's no Wi-Fi network, the song download or purchase is queued. The benefit for Wayport is to have yet another hefty but undisclosed fixed sum underlying its fixed infrastructure costs. In the past, Wayport has done deals with Nintendo, ZipIt, and Eye-Fi to allow all devices in a category unlimited access at McDonald's locations. McDonald's obviously gets more customers, or existing customers who spend more time or visit more frequently. A partnership with a hotspot operator means that Microsoft doesn't have to provide tools and their users endure frustration in joining a network. "We're experts enabling one click to get this network connected," Lowden said. He noted that Wayport has opened test labs to work with manufacturers in Japan, San Francisco, San Diego, and Seattle. "We're working with these guys from day 1 to make sure it's one click to get connected," he said. I'd also note that San Diego happens to be where Qualcomm's headquarters are located, not that Lowden gave me any tip-off there. And I have to just say: burn, burn, burn on Apple. Despite Apple partnership with AT&T, which relies on Wayport to operate the AT&T-branded hotspot network and resells access to Wayport's own network, iPhone and iPod touch users have no inclusive Wi-Fi service. AT&T slipped a few times and ostensibly opened up their network or released details that iPhone users would gain free hotspot access--like all AT&T's fiber and all its standard and premium DSL customers. As Wi-Fi becomes an expected part of any handheld gadget, the venues in which Wi-Fi is used multiply beyond cafes and hotels. Lifestyle locations--which could be clothing stores, nightclubs, ski resorts, and the tops of mountains suddenly become places where people want the same kind of access they have at home. Ultima thule is already unwired. Yes, I touched an iPhone 3G: At Apple's big developer event kickoff on Monday, Steve Jobs introduced the iPhone 3G. Later that day, in a briefing, I was able to handle and use the phone briefly. It's lovely. But its inclusion of 3G service coupled with Wi-Fi, as well as a real GPS chip coupled with assistive cell-tower triangulation and Wi-Fi network location approximation means that you have a device that might fairly replace a computer for many purposes. I've had an iPhone with 2G (EDGE) service since its release, and I recently took a two-day trip with my older son leaving my computer behind. (I was able to use a relative's machine, but only did so to be able to type email more efficiently.) If Apple would simply allow the use of the Bluetooth HID profile (human interface devices) for keyboard and mouse support, a compact foldable keyboard would be the only accessory I would need. Note that the iPhone 2G and 3G aren't more powerful than other, similar devices. Symbian platform devices from Nokia and others are in notably short supply in the US, but come in great quantities and varieties elsewhere, and have some pretty impressive computational power; Nokia owns nearly 50 percent of the worldwide smartphone market. Likewise, you can run desktop-to-mobile programs under Windows Mobile that let you have real computer applications repackaged for better use in the smaller form. But that's not what the iPhone is about. It's a non-compromise device, even when a little compromise might help. The lack of a touch-typist keyboard hinders data entry, but it doesn't restrict any other purpose of the device. The inclusion of those keyboards is a huge compromise for all its competitors, even though it allows those competitors to act more like little computers. And that's where it's odd for me. The iPhone is much more like a full-blown computer than any smartphone I've used. It might be the superior browser, and the fact that a single company and design vision has ensured the maximum CPU is available for each current task, and that the interface and actions are nearly always consistent across every piece of software. Contrast that with many smartphones that don't just have ugly interfaces, crippled Web browsers, and varying input methods, but also require you to learn a different approach to using nearly every different piece of software on the phone. Apple isn't about to kill its competitors, but they are providing an odd amount of support for killing a laptop. On a slightly tangential front, Apple CEO Steve Jobs claim that their phone's 3G speed was nearly that of Wi-Fi requires some explanation. Jobs needed a footnote: "compared to typical Wi-Fi hotspots that have about 1.5 Mbps of downstream backhaul." The iPhone is clearly processor limited for how fast it can render Web pages and handle network processing. If you stick an iPhone on a 10 Mbps-backed network via Wi-Fi, the browsing experience isn't very different than on a 1.5 Mbps-backed Wi-Fi hotspot, in my experience with the current phone. So clearly, there's more optimization to be done and more hardware upgrades to come in order to have a mobile device that can live up to whatever network it generally works on. For the iPhone 3G, Wi-Fi is an alternative, but it's clearly not intended as a superior alternative. Devicescape has its first operator partner for its seamless login system for mobile devices and laptops: Devicescape's approach is to remove the necessity for a device's owner to have to sign in: no tedious entry (and memorization) of account details for your camera, iPhone, or what have you to get online. The operator deal puts their software front and center in the plans of the carrier as it rolls equipment and services out to its customers, driving more use in this case of the 8,000 hotspots offered across Europe by DT. Reducing friction in getting a device on a network almost by necessity increases a network's use. The company also announced its operator service. Devicescape recently released its 2.0 software--see "Devicescape Releases New Connection Software: No Computer Required to Configure, Gain Hotspot Access," 2008-02-05--which allows properly equipped devices to connect to a hotspot network without any prior configuration or Web site account setup. PC Magazine identifies 10 "wacky" Wi-Fi products, although only a few are truly offbeat: The magazine rounds up items like the Nabaztag from Violet, the Wi-Fi pen, and a Wi-Fi detecting T-shirt and watch. I suppose these are more "ways to spend your cash that aren't truly useful, even though they might be fun." They also include the Eye-Fi, eStarling's picture frame, and a Wi-Fi-enabled remote control from Acoustic Research that are all a bit more practical--still about entertainment, but they actually do something. David Pogue reviews several of the latest digital picture frames at the New York Times: I have frankly avoided reporting much on digital picture frames, even those with wireless, because so many of them seemed far too expensive for their simple function of automating a rotating display of photos. Product announcements seem to come weekly, which means that a lot of people are buying these for their parents and grandparents, loading them with photos, and then the same pictures display for the next year until the relative takes it down and claims it "broke." Pogue makes it clear that I'm not far off in avoiding writing about these frames. He likes the Kodak EasyShare EX1011 at 10 inches (diagonal), which supports Wi-Fi, but not Mac OS X, and which can link up to Kodak Gallery to pull in new photos over the Internet from galleries you update from wherever. That really does make it appropriate for computer illiterate relatives. Or those who just don't want to monkey around. The 800 by 480 pixel resolution is also quite reasonable for that size of display. Pogue notes that the dimensions, however, put it into a widescreen orientation inappropriate for most digital photographs. At $250, though, that's a hefty gift and I find hard to swallow despite the screen size and inclusion of Wi-Fi. Pogue also likes the much cheaper PanDigital Wi-Fi Picture Frame ($150, 8 inches) has Bluetooth and Wi-Fi but can't use Wi-Fi to grab locally hosted photos, just from Picasa. He has kind words for the SmartParts SP8PRT ($280, 8 inches) frame shipping in March that has no Wi-Fi but can print photos through a built-in, hidden dye-sublimation printer. I find the idea a little funky: why print from a picture frame that you have to load with photos from a computer? It seems like you'd want Wi-Fi most of all in this kind of device to send pictures to others, and they could make prints of photos they like. Three others, he generally excoriates. The Parrot DF7200: "the resolution is so coarse...it's not a big improvement over your cellphone screen." The eStarling second attempt: "...even though this frame is much better than its disastrous first model last year, it’s still flakier than a croissant." Momento 100: "Photos from the Web arrive on the frame at half size, bizarrely floating in the center surrounded by fat black margins." There's a lengthy comparison chart also online. Canary Wireless hits another homer with latest Digital Hotspotter: About three and four years ago, the market became suddenly glutted with a variety of compact Wi-Fi detectors: relatively inexpensive devices designed to give you a snapshot of the radio frequency environment around you in the more common Wi-Fi band (2.4 gigahertz). Trouble is, most of them either worked poorly or provided too little information. The original Digital Hotspotter and a combination detector/adapter from Zyxel were my two favorite devices for the amount of information they provided. A detector, to be useful, must show enough network information that it prevents you from having to open up a laptop; or enough information to help you find a stronger signal or troubleshoot what's wrong with a network. The Digital Hotspotter (model HS-20, $59.95, on sale 15-Feb-08) really does shine, partly because it now includes support for detecting 802.11n networks, and reveals the network's top speed based on packets it's sniffing. The device has three buttons now instead of one, all along one side. The top button is the power button: hold it down to turn it on or turn it off; press it while it's on to rescan the environment. Previous and next buttons let you scan through the available networks. See this YouTube video I shot for a live demonstration. The display now shows the network name, whether it's secured, its form of encryption, the type of 802.11 network (B, G, or N), the top speed based on it's network settings, and the channel on which it's operating. My only real complaint with the device is that it turns off its backlighting a little too quickly while I'm still trying to read the scrolling information about network speed and other parameters. The price is a little high for the casual user, but a road warrior, network administrator, or those desiring to find open and free networks should find this a bargain. Cameras on San Francisco street corners deliver choppy videos: Money was invested, time spent, but the 68 cameras don't record video well enough to help in cases or bring people to justice. Nearly $1m has been spent. The cameras are wireless (not using Wi-Fi, I believe), but the real problem appears to be storage and configuration--and the fact that "surveillance cameras have delivered mixed results in studies of their effectiveness at decreasing violent crime." AP rounds up three messaging appliances: Sony Mylo COM-2 (not really available yet, $300) has dramatically improved on its first model, the reporter says, seeing a few glitches in pre-release software, but having a much more favorable reaction than anyone did to the first Mylo. The article also looks at the Nokia N810 tablet ($480), which is a full-fledged computer with good, but not great, IM capabilities: Yahoo and AIM aren't supported out of the box, but require additional software. The Zipit Wireless Messenger 2 ($150, optional $5/mo for 1,500 incoming/1,500 outgoing SMS messages) gets a thumbs up, too.